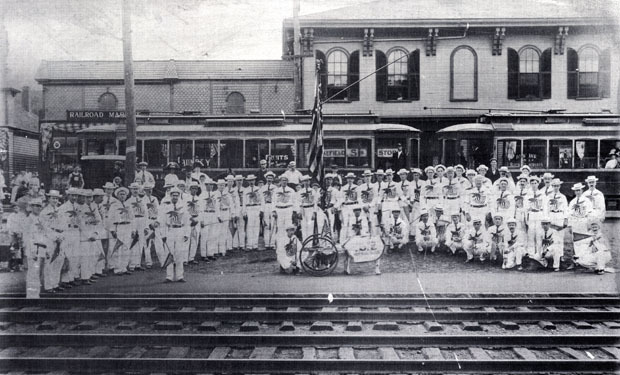 "This group at the upper train station is not yet identifiable, but look resplendent with the American flag across the front of their uniforms. The gathering took place in front of the Eaton grocery store/bank building and the Railroad market, at the street railway tracks, across from the upper train station. In the 'Hand-Book of Wakefield,' published in 1885, a section was devoted to the Societies and Clubs. 'The Societies and Clubs of Wakefield (and there are many of them) exemplify the fact that Wakefield is noted for the congeniality of her citizens. In these clubs and organizations are drawn together the various little groups, having similar desires in mental, social and physical culture.' Societies and clubs of the times included, Wakefield Amateur Rifle Association Wakefield Lecture Association Victory Colony, No.23, United Order of the Pilgrim Fathers Neptune Lodge, No.137, Independent Order of Good Templars Chairmakers Benefit Association the Equity Associates of Wakefield and the Wakefield Chautauqua." - Text from calendar by Jayne M. D'Donofrio. “Railroad Street/North Avenue, circa 1890s,” NOBLE Digital Heritage, accessed April 22, 2019, https://digitalheritage.noblenet.org/noble/items/show/6842.